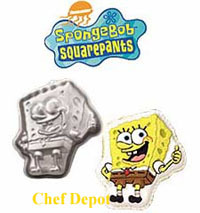 These are high quality cake molds. Many of these are custom manufactured by us in the USA. These will last for generations with proper care. The molds work great with your favorite cake recipe or a box of instant cake mix. Chefs Note: Many professional Pastry Chefs use instant boxed cake mixes for cake molds to save time. You can put a lot of time into fillings & decorating the finished cake. Kids birthdays cakes can be fast and easy with these cake pans. 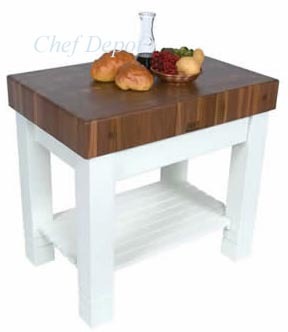 Chef Designed Tables for your new kitchen, bakery or workshop! Click Here! 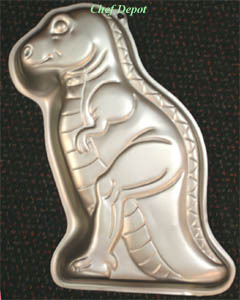 This is our tall Dinosaur Cake Mold! It has a lot of detail and it is easy to decorate with colored icing. It holds 2 standard boxes of instant cake mix, or make your own! Decorating instructions are included. Click Here for pure Vanilla Extract & Vanilla Beans! THIS IS Now GonE Forever ! 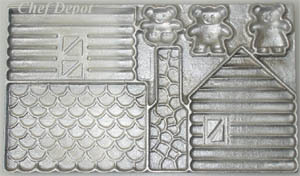 This is our Gingerbread House Mold. 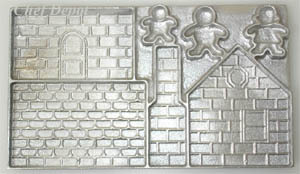 The mold is two sided, high quality thick cast aluminum with a lot of detail! Make your own extravagant, edible gingerbread house for the holidays. 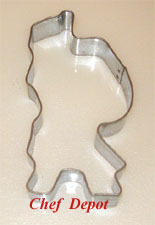 Roll out your gingerbread dough and press it into the mold to form all the detailed pieces. Bake your gingerbread in each side to create the four walls. Use Royal Icing to assemble and decorate. Also great for creating a brick house or log cabin or an ice cream filled birthday cake. A recipe is included. Mold measures 6 1/2" H x 11" W. Made in the USA!! 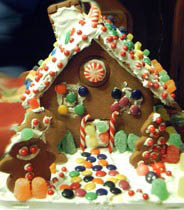 Chefs Note: We use Cream of Tartar in our icings for our Gingerbread Houses assembled with royal icing and meringues. Chefs Gingerbread Recipe is here! This is the highest quality Cookie Press made today. 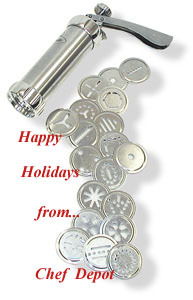 All metal, aluminum cookie press, made in Italy. Includes 20 useful disks. This set makes a perfect gift or use it to make perfect holiday cookies! Chefs Note; This is the press that you buy for a lifetime of use. Click here - Italian Pasta Tools! 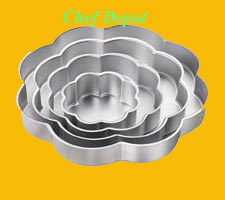 This is a high quality Solid Stainless Steel Cookie Cutter. Use it to make perfect Santa shaped cookies and multi baked edible decorations this holiday! More Cookie Cutters are here! More Porsche Knives, Click here! Great Knives, this sale will be over soon! Our new flower pan set lets you easily create a Spring Flower Petals Cake. Stack the tiers for a dramatic presentation that looks sensational with yellow and green icing or fondant. Includes 6, 9, 12 and 15 in. pans. Quality aluminum holds its shape for years. Each pan is 2 in. deep. Chefs Note: These pans are great. They bake well and even. I enjoy using these pans. They don't stick when greased well and cook level. Get creative and add extra flowers on the sides. Dont forget to try our Vanilla paste, in your fillings, its Simply Amazing. We usually add Almond Extract to the batter of these cakes. Click Recipes Link above for great cake recipe ideas! 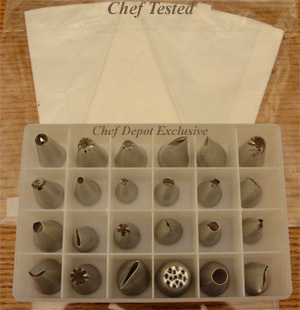 Many professional Pastry Chefs use instant boxed cake mixes for cake molds to save time. Easily add fillings and decorate your finished cake! 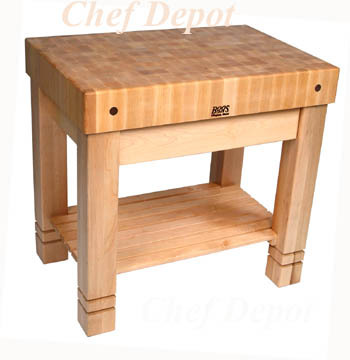 #1 USA Made Butcher Blocks!Click here for Spices, Wild Mushrooms, Saffron, Peppercorns, Vanilla Beans and Gourmet gifts! Our exclusive 24 pc. Economy Pastry Tip Set is a good starter set. The set contains: 24 decorating tubes including stars, spirals, leaf, rose and other flower tubes and a 14 in. plastic coated pastry bag. Chef Notes: A nice starter set! Click Here for more pastry tools, bags and tip sets! 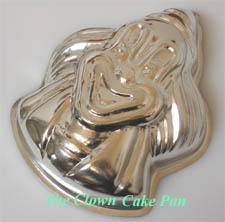 This is our Happy Clown Cake Mold. This mold holds 7 cups of cake batter (11 in. tall x 8 in. wide). The mold is made out of tin plated thick steel for excellent heat transfer; the result is faster cake baking. These pans also have great anti stick properties. Most of these pans have a hole on top and can be used as a display. Recipe is included! Sold Out, call for large quantity orders. This is the Messermeister Trio Swivel Peeler Set. 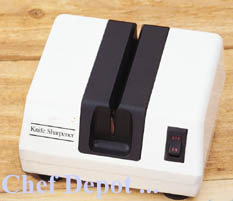 Razor sharp blades with micro serrations make a fine shredded, sliced or julienne out of any vegetable a snap! We like it for fast garnish and salads! Chefs Note: This peeler set is amazing! We love the edge.Click Here for CHEFS pro peelers! Click Here for dried Morel Mushrooms! Create a romantic heart wedding cake. Stack the tiers for a dramatic presentation that looks sensational with red icing or fondant. Create the ultimate heart cake, celebrate showers, birthdays and more. Includes 6, 10, 12 and 14 in. pans. Quality aluminum holds its shape for years. Each pan is 2 in. deep. Chefs Note: These pans are great. They bake well and even. I enjoy using these pans. They don't stick when greased well and cook level. Dont forget to try our Vanilla paste, in your fillings, its Simply Amazing. We usually add Almond Extract to the batter of these cakes. Click Recipes Link above for great cake recipe ideas! 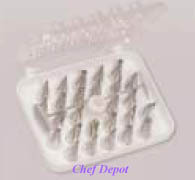 Many professional Pastry Chefs use instant boxed cake mixes for cake molds to save time. Easily add fillings and decorate your finished cake! 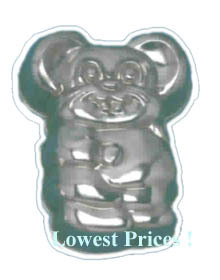 This is our Teddy Bear Cake Mold. This mold holds 7 cups of cake batter (11 in tall). 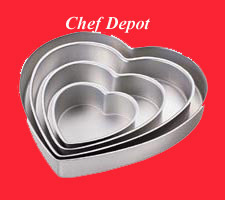 The mold is made out of tin plated thick steel for excellent heat transfer; the result is faster cake baking. These pans also have great anti stick properties. Most of these pans have a hole on top and can be used as a display. Our new Leftovers Food Containers are perfect for food on the go. Perhaps the thickest and strongest you can buy (I can stand on these). At just 8 oz. the new and cool mini food storage container fits in the palm of your hand and is particularly cute! 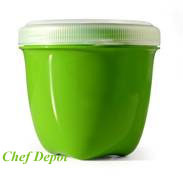 Shaped and colored like green apples, these round Food Storage Containers are a friendly addition to any refrigerator or lunchbox. Chefs Notes: We use these for cut up apples, pears and peeled oranges. Colored & Flavored Frostings, Picnics, backpacking, lunches, catering, hummus, olives, dip, fruit and more. They have screw top lids that wont pop off in your backpack or briefcase. Eco Friendly, made from high grade food safe recycled plastics, here in the USA! 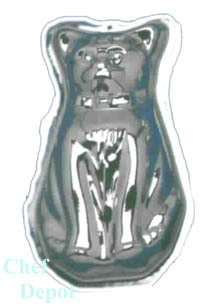 This is our Cat Cake Mold. This mold holds 6 cups of cake batter (11 in. tall). 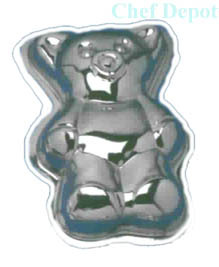 The mold is made out of tin plated thick steel for excellent heat transfer; the result is faster cake baking. These pans also have great anti stick properties. Most of these pans have a hole on top and can be used as a display. Click Here for Cocoa Powder & Swiss Chocolate!! This is our Dog Cake Mold. This mold holds 6 cups of cake batter (11 3/4 in. tall). 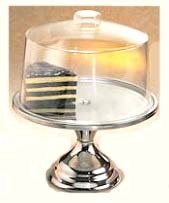 The mold is made out of tin plated thick steel for excellent heat transfer; the result is faster cake baking. These pans also have great anti stick properties. Most of these pans have a hole on top and can be used as a display. 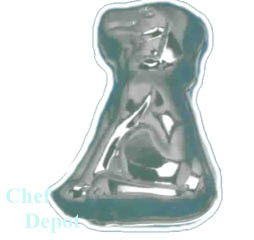 Click Here for the Lamb Cake Mold! Click Here for more Pastry Tips & Pastry Bags ! This 100 minute stopwatch timer is perfect for those who are seeking a compact design. Counts up or down to 100 min. with seconds. 3 way mounting, clips, hands from rope, magnetic back. Last count recall. 5 year mfr. warranty. SOLD OUT You Waited Too Long ! 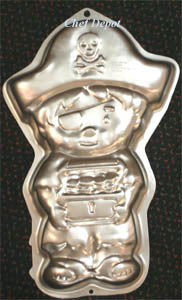 This is our Little Pirate Cake Mold! It has a lot of detail and it is easy to decorate with colored icing. Decorating instructions are included. 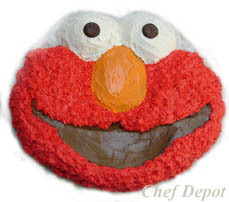 This is our Elmo Cake Mold! It has a lot of detail and it is easy to decorate with colored icing. It holds 2 standard boxes of instant cake mix, or make your own! Decorating instructions are included. We like to make a chocolate cake with red icing, orange nose, black and white eyes and mouth - decorating tips are included. We used chocolate coins for his eyes. Click Here for the best Cocoa Powder and Chocolate that you will ever taste! This is our Mouse Cake Mold. This mold holds 8 cups of cake batter (11 1/2 in. tall). 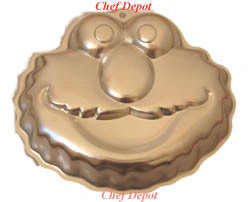 The mold is made out of tin plated thick steel for excellent heat transfer; the result is faster cake baking. These pans also have great anti stick properties. Chefs Note: Yogurt Cake tastes great! Free Recipes, Click Here! Easily add fillings and decorate your finished cake! Most ovens are not accurate! Test yours with our Pro Oven Thermometer! 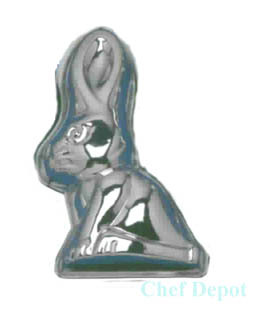 This is our Christmas Tree Cake Mold. 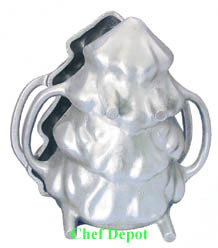 The mold is two piece, high quality thick cast aluminum with a lot of detail. 8 1/2 in. tall, it fits together perfectly and it stands up for display when not in use. The two piece mold looks beautiful on display. This Nordicware 13 inch x 9 inch x 2.5 inch deep Professional Heavy Gauge Non Stick Brownie / Cake Pan is great for your favorite recipes. Ever bake something to go? Now you can easily transport brownies to a party or a cake to your holiday gathering! After it cools, decorate and snap on the lid! You are good to go! Made in USA. Lifetime Mfr. Warranty. 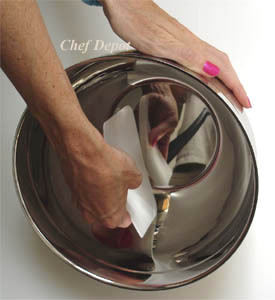 Chefs Note: This no stick heavy weight pan will conduct heat evenly and help you make a perfect cake! We like it for the high quality thick pure aluminum with tough no stick coating. We use ours for iced yellow cake, bread pudding and brownies. It's great for making bread pudding! Click the link to try it out! Chefs Favirote Kitchen Furniture! Made in the USA ! Our non stick tongs are comfortable and lightweight! These will work for flipping foods on the BBQ or turning items in non stick frying pans. Wil not scratch your pans! 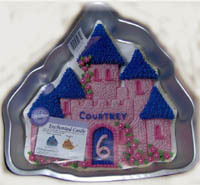 This is our Enchanted Castle Cake Pan! It has a lot of detail and it is easy to decorate with colored icing. It holds 1 standard box of instant cake mix, or make your own! It measures aprox. 13 in. x 12 in. x 2 1/2 in. deep. Decorating instructions are included. This is the new Orange Kyocera Ceramic Peeler, it holds an edge without sharpening. This is a great peeler! It's very comfortable and easy to use. This is our Hello Kitty Cake Pan! It has a lot of detail and it is easy to decorate with colored icing. Made from durable aluminum. It holds 1 or 2 standard box of instant cake mix, or make your own! Decorating instructions are included. Limited Edition, these will be gone soon. 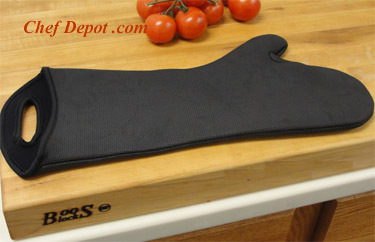 These are professional bakers oven mitts. They are made from thick quilted 100% cotton flameguard fabric for superior heat and flam resistance. Sewn with Kevlar thread for long lasting durability. They are government tested to stop heat and flames up to 400 degree's F. These 17 in. 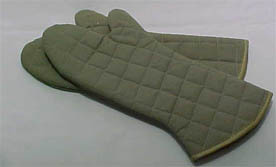 oven mitts are the choice of professional Bakers and Chefs all over the world. 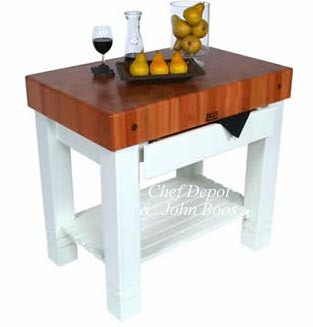 Click Here for Rock Maple Butcher Block Islands! This is our Toy Story Buzz Lightyear Cake Pan! It has a lot of detail and it is easy to decorate with colored icing. Made from durable aluminum. It holds 1 or 2 standard box of instant cake mix, or make your own! Decorating instructions are included. Limited Edition, these will be gone soon. Chefs Note; These pans are very nice. Our favorites are Chocolate, Blueberry, Strawberry Banana and Vanilla Brownie muffins. Scoops are above on this page. We use real pure Vanilla Extract in all of our muffin recipes! Made in the USA Sale - Call us or email us ! Call for seasonal sales & questions! Made of thick flexible Neoprene, these Gloves will protect from intense heat, up to 500 F. and cold temperatures too. Non slip and waterproof, they provide safety. Lined for comfort, stretchable, fits left or right hands! Measures 17 in. x 7 in. opening. Chefs Note: Feature a oval hole to allow hanging on the wall when not in use. Buy 2 and save. 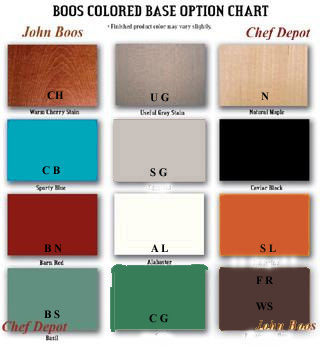 Click here for our Chef Tested Cutting Boards! As seen on TV. Click Here for More Colors of these sharp knives! 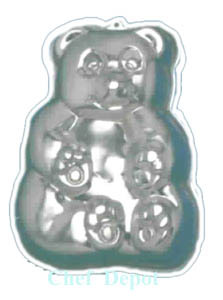 This is our Bear Cake Mold. This mold holds up to 8 cups of cake batter (11 in. tall). 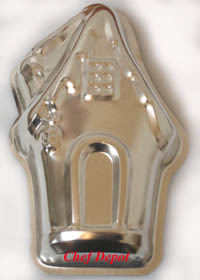 The mold is made out of tin plated thick steel for excellent heat transfer; the result is faster cake baking. These pans also have great anti stick properties. Most of these pans have a hole on top and can be used as a display.